We’ve had more than a few films over the years about religious leaders who experience crises of faith (Martin Scorsese’s 2016 film, SILENCE, may be the most recent example) but when noted writer-director Paul Schrader, screenwriter of such classic films as TAXI DRIVER; AMERICAN GIGOLO; RAGING BULL; and THE LAST TEMPTATION OF CHRIST, tackles the subject, it’s time to sit up and take notice. It’s no coincidence, by the way, that Scorsese directed some of those films too. 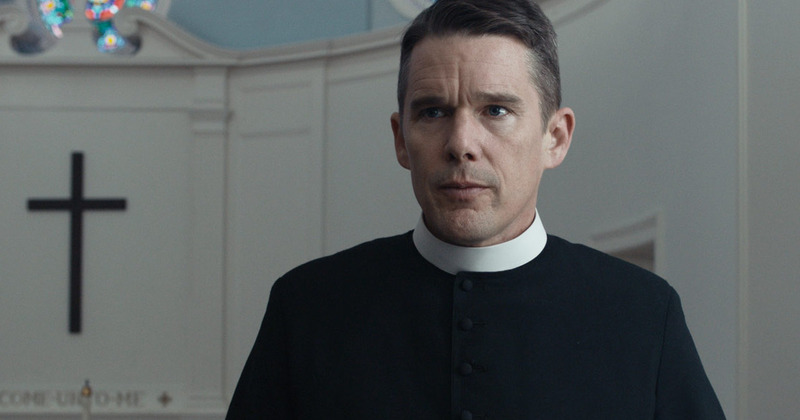 In FIRST REFORMED, Reverend Ernst Toller (Ethan Hawke, BOYHOOD; the BEFORE SUNRISE trilogy) is an introspective and devout minister to the First Reformed Church, located in upstate New York. First Reformed, a 250-year-old Dutch Reformed church that was once a stop on the Underground Railroad, functions more these days as a museum than a house of worship as it struggles to get more than a handful of people to come and pray there on any given Sunday. The megachurch down the road, Abundant Life, is where the action is with its large and well-appointed sanctuary, a student choir with monogrammed polo shirts, state-of-the-art multimedia facilities, cheery cafeteria and charismatic leadership led by the Rev. Joel Jeffers (Cedric Kyles aka “Cedric the Entertainer”, in one of his rare serious acting roles). In fact, Abundant Life now owns First Reformed and we learn that Jeffers installed Toller, a former army chaplain, in the job there as a favour to him following the death of his son in the Iraq War and the subsequent disintegration of his marriage. One day, Mary (Amanda Seyfried, WHILE WE’RE YOUNG; FATHERS AND DAUGHTERS; MAMMA MIA! HERE WE GO AGAIN), one of Toller’s few remaining congregants, asks him to counsel her activist husband, Michael, who would like Mary to have an abortion rather than bring their baby into a world that is suffering from the effects of climate change. After Toller meets with Michael and later delves into his life and his activities, he begins to have doubts about the role of the church, and especially large churches like Abundant Life, in light of the financial support they receive from the very corporations that are polluting the environment. Toller also has his own personal problems to deal with. He has chronic stomach pain, which he quells with a mixture of alcohol and Pepto-Bismol, and it’s only getting worse leading him to see a doctor who suspects he has cancer. Although many would argue that Toller has been dealt a bad hand in life, he holds fast to the belief that man can’t possibly understand G-d’s ways. That tenet, though, is put to the test as the day of his church’s big anniversary celebrations approaches. It’s then when decides he needs to set things right before he dies. Ethan Hawke is outstanding in his portrayal as the reverend. Unlike many actors in Hollywood who make regular visits to the “dermatologist”, Hawke bares his furrowed brow for all to see and it works here as we witness the physical and emotional toll that the reverend’s inner torment has taken on him. It’s a devastating performance in its understatement. I have equal praise for Amanda Seyfried who also dials her emotions way down in her portrayal of a young woman who may not be all that she seems (and that’s part of the ambiguity with the film’s ending). FIRST REFORMED is a quietly powerful film that you should definitely check out. The film premiered last year in Venice and has spent most of the year on the festival circuit. It opened commercially in the US in May and then in the UK in July, but so far it doesn’t look like it’s coming to Hong Kong anytime soon. However, we have choices these days – legal ones too. It’s available for purchase on YouTube for about the price of a movie ticket and I understand it’s also available on NOW TV. Watch the review recorded on Facebook Live in RTHK Radio 4’s studio on Thursday, October 25th at 8:30 am HK time!